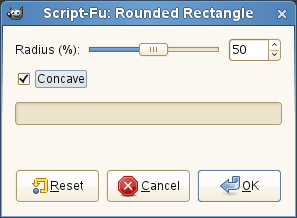 The “Rounded Rectangle” Script-Fu command converts an existing selection (rectangular, elliptical or other shape) into a rectangular selection with rounded corners. 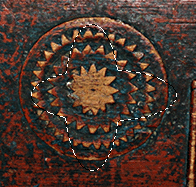 The corners can be curved toward the inside (concave) or toward the outside (convex). To do this, the command adds or removes circles at the corners of the selection. You can access this command from the image menu bar through Select → Rounded Rectangle…. You can enter the radius of the rounded corner in percent by using a slider or a text field. This value is a percentage of the height or the width, whichever is less. If you check this box, the corners will be concave (curving toward the inside), rather than convex (curving toward the outside).